Project Canvas, the BBC led digital TV service that is subscription free, has announced YouView as the name of its new catchup tv service. YouView will consist of seven days worth of catchup TV similar to the BBC’s existing BBC iPlayer service, as well as a website offering free TV on demand, tv apps and widgets. TV channels signed up to take part include the BBC, ITV, Channel 4 and Five. YouView will launch with seven days EPG (electronic programming guide) that will go both backwards and forward, allowing viewers to watch or record any programme type from the whole week. The service is expected to launch in the first half of 2011. Set-top boxes will be designed for the Freeview DTT platform and include a PVR (personal video recorder) similar to the Sky+ and Virgin TV boxes. There’s no word on who will build the set-top-boxes. Once viewers have bought a set-top-box, there will be no further subscription fees, although YouView requires a broadband connection to work. 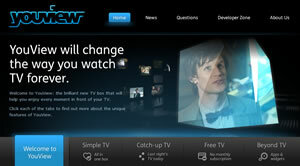 Richard Halton, formerly project director, is the CEO of the newly formed YouView TV Ltd. He will work alongside Kip Meek, the company chairman, appointed in August. “YouView is a brilliant new subscription-free TV service which combines the best TV with on demand services and internet content. I am delighted to be leading the team who will make it a reality and think it will change the way we watch TV forever,” said Halton. Whatever the rivals think, Project Canvas (oops i mean Youview), could mark the start of a great new era in online tv services.